Whole grain foods include whole wheat bread, brown rice, and other unrefined grains. Whole grains are considerably more nutritious than refined grains. Refining removes most vitamins and minerals and all the fiber. White rice is refined brown rice that has lost vitamins, minerals, and fiber. So how can we eat more whole grain foods? And a greater variety, instead of just wheat and corn? Cereal grains are technically only wheat, rice, corn, and their close relatives. Alternative grains are those unrelated to wheat, rice, and corn. Curious about your choices? See this list of grains. Brown rice is one of the best of the whole grain foods. It is available in many varieties in the bulk section of the natural food store, or in bags. When I first cooked brown rice, I recognized its taste from dishes in good restaurants. Don't bother with precooked brown rice--its taste is very unsatisfactory. Here's how to cook brown rice. Oatmeal is a healthy whole-grain breakfast or snack. Check out other whole-grain hot cereals. 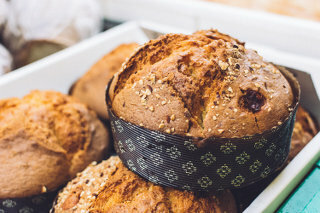 Whole-grain breads of all types can be found at gourmet and natural food stores. Try a loaf to replace white bread and see how you like it. Traditionally-made sourdough bread has a gourmet taste. The natural leavening of sourdough improves the nutritive value of the bread. Breads, rolls, and tortillas made from sprouted grains are refrigerated in natural food stores. These are very tasty and digestible. Natural food stores have a great selection of whole-grain pastas, made from whole wheat, brown rice, corn, and alternative grains such as quinoa. Try tabouli: a Middle Eastern salad based on cracked wheat, mixed with oil, onions, tomatoes, and other vegetables and herbs. Look for it in Middle Eastern restaurants, gourmet, and natural food stores. Explore the bulk section of the natural food store. This is where grains, beans, nuts, dried fruit, and other storable healthy foods are sold from bins. There will be a choice of whole grains, flours, pastas, and granola. Try an uncommon whole grain, from the bulk bins at the natural food store or as sold in a box. You cook them like rice or hot cereal; cooking instructions will be available at the natural food store (you may have to ask). Guide to whole grains plus recipes.